Upon entering the game, you're taken into a beautiful (note to self: better not overuse this word early, because I'm going to need it later) intro music and dialogue text sequence, which danced into focus and then out of focus. It reminded me that only special games bother to do something unique and aesthetically pleasing for seemingly simple things like text. Touches like these that they didn't have to add, but did for detail, uniqueness and immersion, will adorn the game throughout. Thankfully, those that want an impression of how the game plays on a minimum spec machine will now get the chance to have it, for the game was previewed on my now 3 year old overclocked 464 Mhz Celeron, 256 megs of RAM, Radeon LE (yes, overclocked for maximum efficiency), but brand new just-bought-yesterday Sound Blaster Audigy. 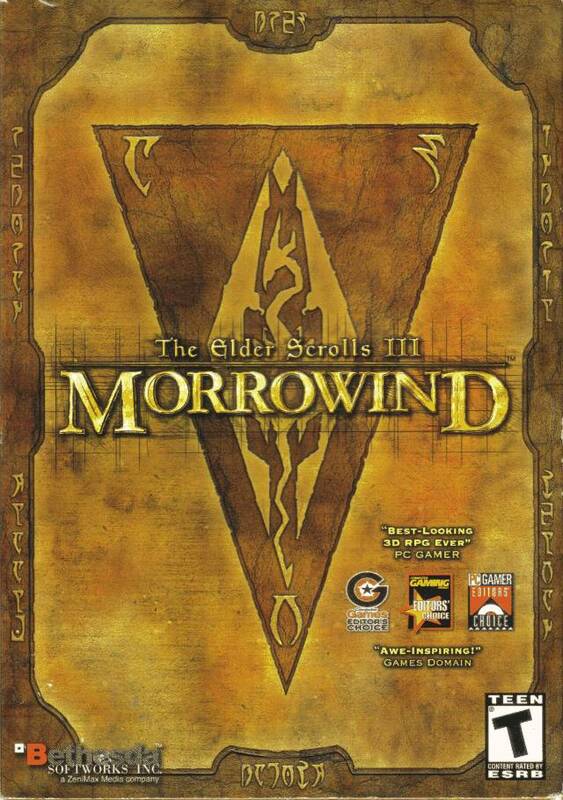 I was having DirectSound issues with Morrowind and the Diamond MX300 so it was because I wanted to experience this game I went out and bought a new card and played 6 hours straight last night without a hitch, as you'll see. Many of the screenshots come from a continuous single session, not at all saved since I was utilizing some of the included "console" features like toggleGodMode, purely for exploration purposes... at least, that's what I told myself and am sticking to. No other "features" were used... except, oh, Axe skill to 100, and oh yes, Security to 100, for those hard to pick doors. This was all after deviating from the 5 legitimate and completely fun hours getting into the game from the beginning, which I will detail first. You've probably heard all about the character generation process in Morrowind, how intuitive it is... how you begin in the bowels of a rickety boat with no name or history, with orders to march into the debarkation building... how it's a mini adventure and tutorial where each person you meet will ask you a personal question which will in turn identify you and create your character... how in that same building you'll learn to move, open your inventory, fight and pick locks, and that finally at the end "show" your papers to the proper authority who then sends you off, a free person in a new world, with little money or equipment.... So I won't go into all that. It's an intricate opening where you'll undoubtedly spend some amount of time simply moving your view around, just to appreciate the realistic candle-lit or fireplace lighting and graphic detail before realizing, or caring, that there is something you can be doing... like admiring the hand-placed dinner sets, forks, cups, bowls, chests, baskets, sacks, carpets on the wall, and so on. You're crazy if you think I did that. I did, however, grab a single herb from a sack in the Captain's room, and he had no remorse about taking every other thing I'd thought they wouldn't miss in the building, away. Beware of thieving in front of others. When you're let loose in Morrowind, anything is possible. Believe it or not, I had no plans to join the Thieves guild once in Balmora, the place the Captain says you should go as per the Emperor's wishes. Instead, this Dark Elven Crusader was intent on joining the Fighter's Guild. First things first - explore the town of Seyda Neen. Most of the inhabitants were helpful, if a little snobby for commoners, or "pleebs" as I like to call them. They would offer brief histories of the surrounding land, the conflict in Morrowind, and local gossip which was perfect for a few of the quests I decided on taking up before hitching a ride on top of the Silt Strider (gigantic insect travel package) to Balmora. One of them involved a man who wanted help getting back some money that was owed him, and I had to make my way up to the top of the lighthouse (that's it in the gorgeous pic) at night for a good view of the surrounding area to see if I could spot the secret hiding place of the culprit. It worked well, and I got a share of the profits. Another involved a group of smugglers that were hiding in a nearby cave in which I was given permission to freely dispense with their lives and collect any booty. Well, at level 1 I was dubious, but decided to try it anyway (that's what saves are for), after getting the hang of swinging a sword by sacking a couple of mudcrabs on the beach. Before I continue, allow me to interrupt with a brief interlude on what the performance was like on my minimum spec machine... actually the minimum calls for a 500 Mhz PIII or Athlon. I figured with my fast IBM hard drive, decent video card and brand new sound card, I pretty much fit the bill for minimum. If you divide the distance slider, which is the most important determinant of framerate, into four pieces, then I found the perfect trade-off for viewability and performance to be a little under the 1/4th mark. Indoors, and in general inside of buildings, performance skyrocketed. It was only outside that the slider made the most difference. When outdoors in wide open spaces, performance was a bit better, and even setting all details to max wasn't too much of a hit to play. When in the towns, though, that bar needed to be at the 1/4th mark, except for screenshots of course. The smuggler's cave looked like a normal house from the outside. Inside, I discovered a large cavernous area with a none-too-friendly man down a ways guarding a gate, who I was able to talk to. After the brief conversation, he attacked me. Taking that as a sign of aggression, I dispatched of him quickly, though not without 1/5th of my total health gone at the fight's conclusion. Looting his body I found the all important key, some nice new leather attire, opened the gate, and continued. My choices were to go further down or to the left toward a gate. To the left were some slaves that could be let out, so I did and they thanked me. Still level 1. Back toward the first gate, I continued on down into the depths to confront an aggressive Wizard who cast on me at sight, and a henchwoman, probably his wife. At this level, even with an Iron Longsword and three attempts, I could not dispatch of him, but did however spot a place back up near the slaves that I could explore over some rocks. So after the reload, I carefully climbed over large boulders and found a secret passage! What fun. Following it I found some more equipment, ring, and an underground river that eventually led me back to... the Wizard and his wife, and a large supply of crates, and a chest. Figuring it was probably too hard to climb back over the boulders I dropped down from at the beginning (due to their height), I had a plan. Zip over to the crates and chest, even while they go aggressive on me, loot them up, and RUN like this was my last life! Despite a little abuse on the way out, it worked. And I made out with a nice Katana upgrade to my longsword.